The late summer and fall is high season for apples. 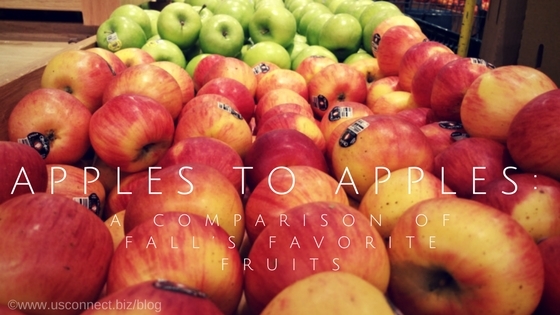 Just in time for this year’s crop, here’s USConnect’s list of what to look for when comparing apples to apples. When it comes to sweet apples, most people look no further than Red Delicious or Golden Delicious. The Red Delicious, in particular, is widely available year-round and is an especially popular choice for the lunchbox. Although these apples share a name and a sweet flavor, they are not actually related. The Golden Delicious, in fact, is particularly prone to bruising and should be stored in the refrigerator and eaten quickly. The Red Delicious has a longer shelf life, but it will become mealy over time. The deep red skin of the Red Delicious has the highest concentration of disease-fighting polyphenols, so it’s a healthy choice. For a tart taste, the clear choice is the iconic Granny Smith apple. Discovered accidentally by an Australian farmer in 1868, Granny Smith apples are known for their bright “apple green” skin, tart taste, and extremely crisp (even hard) texture. Granny Smith apples keep for a long time, so they are a good choice if you want to keep healthy snacks on hand. However, their green skin has the fewest polyphenols. Their tart flavor is a great complement to salads or cheese. What many people love about apples is their crisp texture. For ultimate crispness, fresher is always better. This time of year, fresh apples are available at farm stands and orchards, many of which allow you to pick your own. If fresh-picked isn’t an option, try a Gala; these popular apples have the sweetness of Red Delicious but with less tendency to mealiness. Braeburn and Fuji apples are also known for their crispness. Want a sweet-tart taste with a crisp-mouth feel? The Honeycrisp is the apple for you. Cultivated by the University of Minnesota and released in 1991, the Honeycrisp has quickly skyrocketed in popularity due to its long shelf life, sweet and tart flavor, juiciness, and firm texture. Although everyone has their own favorites, the Honeycrisp lands at number one on a lot of people’s lists. As we’ve discussed here and here, the future of foodservice is fresh. This trend is sharpest among Millennials (those born between 1981 and 1997), although other generational groups are also coming along for the ride. Most nutritionists and healthcare providers agree that fresh food is healthier than food that’s overly processed and packaged. However, this sharp upswing in the popularity of fresh food can create difficulties for foodservice providers. Several decades ago, foodservice distributors provided “one-stop shopping” that streamlined deliveries and allowed economies of scale that drove down prices. With lower demand for fresh food, weekly or bi-weekly deliveries were the norm. 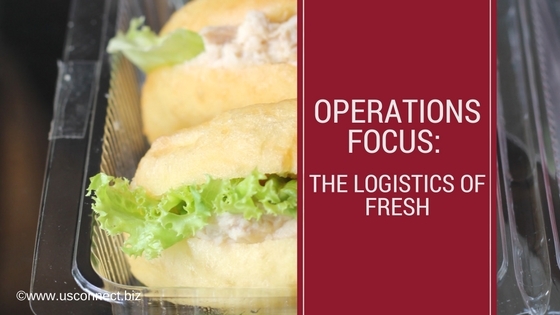 But in today’s market where freshness reigns, foodservice providers need to look to innovative logistics in order satisfy customer demand. Stocking and maintaining appropriate inventory is especially tricky with fresh foods. Order too much and it spoils; order too little and customers can’t get their choice. Given the short shelf life of fresh foods, either option is risky. Technology is helping to solve this problem with tracking and analytics systems that provide real-time visibility of inventory needs and allow businesses to right-size their orders to meet customer demand. One foodservice expert also suggests a specialized transportation system called perishable consolidation. Perishable consolidation is perfect for transporting fresh food that doesn’t fill a complete truck (known as less-than-truckload, or LTL). LTL shipping reduces the time that fresh food must sit in a warehouse waiting to be shipped, thus increasing its freshness. USConnect strives to continuously improve its Bistro To Go!™ fresh food kiosks—always looking for fresher foods and greater choice. Improved logistics, technology, and transportation help our efforts.